Crosshall Marine is a friendly family run business, which has been established for more than 30 years. We pride ourselves in offering our customers the best service in well kept grounds in a tranquil tucked away setting, and friendly atmosphere. 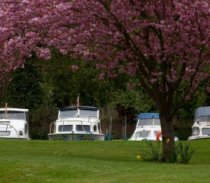 The marina is set in a picturesque four acre site adjacent to St. Neots Golf Course on the River Great Ouse approximately half a mile downstream from St.Neots town centre. The Great Ouse offers boaters an extensive range of waterways with so many tributaries to explore and towns and villages to visit. The River Great Ouse weaves through the landscape of East Anglia, and inhabits 100’s of different species of wild life. The Great Ouse alone runs for 75 miles, but together with its tributaries, the River Cam, Lark, Little Ouse and Wissey, provides approximately 140 miles of navigable waterway, offering good fishing and riverside walks, flanked by market towns and villages. 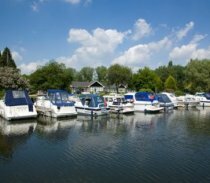 We have more than a 100 pontoon moorings along 1500ft of river frontage, all serviced by water and some by electricity. The marina’s workshop offers the full range services with on-site lifting machinery, a slipway and chandlery and provide Calor Gas and Diesel.